Look up - it is the best way to enjoy the magic of Birmingham&apos;s architecture. It is particularly true of the design of some of the city centre&apos;s shops where frontages are often obliterated and we lose sight of the original building. We need to admire a building as a whole, trace its line against the sky and see how it relates to its neighbours. Birmingham should be proud of the shops that were such an important feature of the growth of the city centre in the 1950s, 1960s and 1970s and here we examine some of the best. Start in Temple Row at the back of House of Fraser, formerly known as Rackhams. Built between 1957 and 1961 and designed by TP Bennett & Sons, this is a building which exudes fun and epitomises the optimism of the age. The rear features zig-zag panelling and windows, very reminiscent of the 1950s and the glamorous style of the Festival of Britain, framed by Portland stone panels of modernist simplicity with a pattern of rectangular windows in groups of three. The difference between the nostalgic and the contemporary provides a striking contrast. Keep looking up and admire the projecting pediment above a recessed top storey, adding a lightness and floating quality to the building. Beautifully complementing the House of Fraser building, the neighbouring 43 Temple Row, designed in 1980 by James Roberts, famous for Birmingham&apos;s Rotunda, features light Travertine marble framing the dark pink-grey granite of the recessed window panels - quality materials used for a quality building. Walking down Temple Row towards Bull Street, you pass another Modernist building. Look up and you are in for a treat, a magnificent clock tower, powerfully heightened by strong vertical lines of Portland stone with a clock face of stunning simplicity and elegance. Take a moment, too, to look back at the building line along Temple Row. 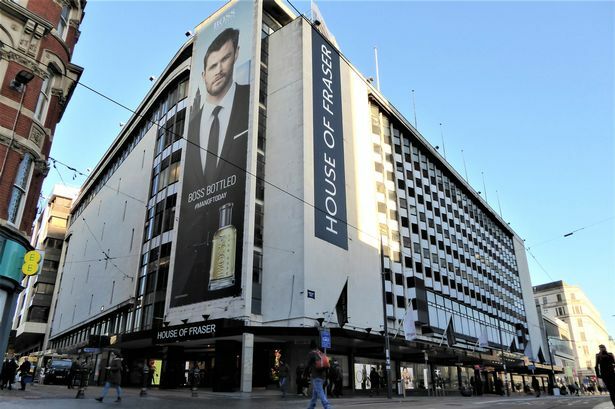 Had you noticed the curve in the House of Fraser building which is almost flirtatious in its subtlety? Walk round to the front of House of Fraser, where the zig-zag design of the windows makes an even stronger statement, contrasted with the larger flat glass panels which span the building at first-floor level. The small decorative panels of narrow slit windows at each end of this span add to the quirkiness of this building, its department store opulence reinforced at ground-floor level by display windows framed in brown and pink marble. Walking on down Corporation Street, you pass what was C&A, now New Look, a handsome 1949 building which was extended in 1958. The upper storeys retain the Modernist symmetrical pattern of the original design including the light metal windows with their fine detailing. Unfortunately, incongruous infilling of the ground and first floors with disproportionately large windows has disrupted the building&apos;s overall harmony. Turn left into New Street. The Britannia Hotel, on your left, built as a department store for Marshall & Snelgrove, started in 1938 but not finished until 1956 because of wartime delays, provides an interesting contrast with its post-war neighbour, the Big Top. Built between 1956 and 1961 and designed by Cotton, Ballard and Blow, the Big Top complex fills a significant area between New Street, High Street, Union Street and Union Passage. On the New Street side, once home to British Home Stores, look up and, happily, some original features remain. Typically Modernist with its light, clean lines of Portland stone is the rhythmic pattern of window panels across the upper floors of the building. The panels of blue-grey slate at the left-hand end and on the angled corners as the building tracks around the site provide decorative highlights which mark its extremes. It&apos;s a travesty to obscure one of them with a huge advertising screen. The use of Portland stone and slate marks the confidence with which architects and builders in the post-war period provided a new "shoppingscape" for the people of Birmingham. A signature feature of much Modernist 1960/70s retail development, the continuous canopy between ground and first floors provided shelter for shoppers. The removal of parts of this canopy and the addition of sections of over-large window glass at ground and first-floor level on New Street and over four floors on part of the High Street side, once home to Littlewoods store, make a mockery of the unity of the original design. The Big Top has many more features, combining buildings of different heights designed for different purposes, a celebratory complex reflecting the mood of the time and now in dire need of some TLC. Around the corner in Union Street there is a dramatic panel of recessed windows with their projecting concrete frames and in Union Passage look up at a panel of Portland stone with rectangular windows reminiscent of the walls that frame the back of the House of Fraser. Birmingham boasts a fascinating history that led to the post-war boom in retail development. Did you know that the Big Top complex was named after the circus that performed on the site after it was bombed in 1941? It was the first major project in the city centre before work began on the Inner Ring Road in 1957 and the tower block was once Birmingham&apos;s tallest. By giving buildings that represent this vibrant period inappropriate make-overs and denying them the care they deserve, we distort the history of our city. It is not a question of personal taste, it is a matter of the heritage we are denying generations to come.